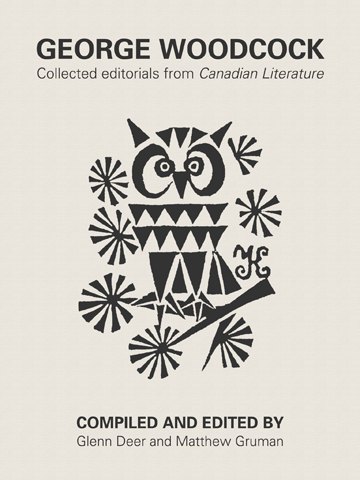 Canadian Literature proudly presents our first ebook: George Woodcock: Collected editorials from Canadian Literature. Compiled and edited by Canadian Literature ’s Glenn Deer (Associate Editor) and Matthew Gruman (Marketing and Communications), this collection contains all the editorials George Woodcock wrote during his tenure as editor and Balancing the Yin and the Yang, written as a guest editorial in 1992. Also included are Alan Twigg’s In Praise of an Omnivorous Intelligence and Glenn Deer’s Alive to Unfashionable Possibilities: Reading Woodcock’s Collected Editorials —two tributes written specifically for this edition. George Woodcock: Collected editorials from Canadian Literature is available in the EPUB (list of supported devices) and PDF formats. —George Woodcock, First Issue of Canadian Literature (1959).